Yes this is a Christmas album (and it is only October), but don't run away just yet. Christmas albums are usually pretty awful things - either compilations of the same dozen or so songs we get sick of every year, or nauseatingly sweet stuff that you seeon get sick of. 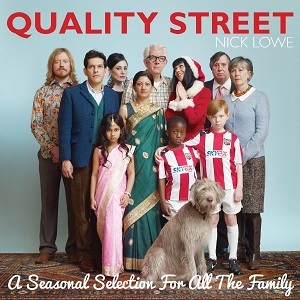 Nick Lowe's Christmas album then is a breath of fresh air as it's quite different. It's got more of a fifties or sixties rock and roll sound for much of the album, and while there are a few traditional songs and a cover of the Wizzard hit "I wish it could be Christmas every day" these have all been given a fresh sound, so the Wizzard cover for instance does have a very different feel to the original. There are also some new songs written by Nick Lowe and there's a definite feel of humour present, particularly with the song "Christmas at the airport" which is about the regular delays passengers experience at aiports, particularly at Christmas time. "I was born in Bethlehem" tells the nativity story but has a country feel to it which sounds like a strange mix but it works really well. It's definitely not your usual Christmas album, and that's what makes this such a good album, and I'd definitely recommend giving this a listen. "Quality street" will be out on 28th October 2013 via Proper Records.